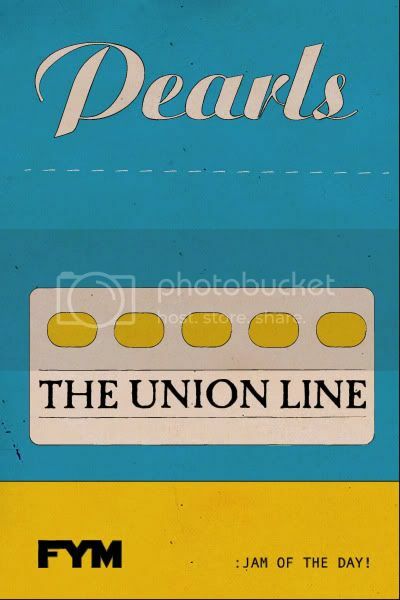 for Young Moderns: FYM JAM OF THE DAY: THE UNION LINE "PEARLS"
FYM JAM OF THE DAY: THE UNION LINE "PEARLS"
After discovering the unsigned super heroes The Union Line last Friday night, FYM can get out of their heads one of their tremendous sonic bliss openers Pearls. The Union Line rhythm section showcases afro-jungle drum opulence, with a whoa-chant chorus that cuts deeply into our soul. Our friends at daytrotter.com found out about these guys before we did, check out their free 4 song session here! Check out this solid live version recorded earlier this year in Salt Lake City of FYM's Jam of the Day Pearls! We will eventually approach these guys about an interview. But still cannot comprehend how these guys are unsigned?!/? Their sonic prowess live produced more kinetic energy than our hearts could take, last Friday opening for the Local Natives. The Union Line is now on our radar, and discovering great bands live like this.. are the reason why we run this site, and enjoy covering live music events! xoxo Enjoy!